Bears have always been a mainstay of picture books. But they became even more so when the book industry went global and foreign co-editions became a make-or-break component of the book contract. Bears look the same in and to every culture and and making them the star of your book often means you do away with the many niggly details that illustrations of children do. Authors, however, nearly always use them as children-in-bear-clothing and write them into stories dealing with human issues. 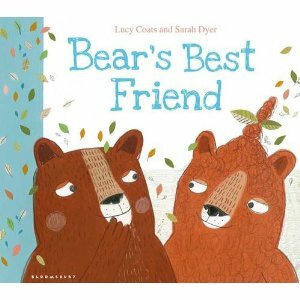 The gorgeous bear in Lucy Coats and Sarah Dyer's story is blessed with many friends but not a 'best friend'. He longs for that special someone he can share special moments with and the thought of not having one fills him with sadness. To while away the lonely hours Bear makes tree-pictures of all his woodland friends. He's got a real talent for trimming topiary and one day someone turns up to admire the pictures....might that someone be looking for a best friend too.....? Lucy's witty text is a perfect foil for the childlike illustrations, full of muted colour. A winner of a book that could become many a child's best friend. So true about the ubiquity of bears as anthropomorphic animal of choice. Maybe the mix of that furry, huggy, caring softness plus the potential for sudden rage that helps children relate to book bears? A lovely recommendation.